It is common knowledge that in Goa, having your artistic work plagiarised, be it literary, music, photography, etc, is not an unusual phenomenon. Often people are completely unaware that they have violated somebody's intellectual property rights. 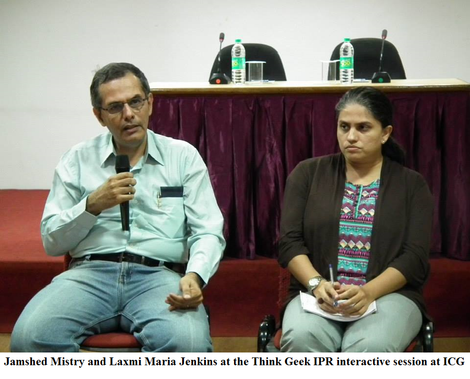 Supreme Court Counsel Jamshed Mistry, who is an authority on media, entertainment and corporate law, and Advocate Laxmi Maria Jenkins from Mumbai spoke on Intellectual Property and Copyrights in Media & Entertainment doing much to dispel misconceptions and provide a wealth of legal information to entertainment and media representatives. The talk was arranged by Ethel Da Costa’s PR company Think Geek Media. During the talk held at the International Centre Goa, it became clear that the root of the problem is the omission of entertainment law from the curricula of law colleges. Naturally, artists remain ignorant too and ignorance has no scope for bliss in this case. The entertainment industry remains fraught with issues that seem to have no plausible solution without appropriate legal acumen. Mr Mistry commented that Bollywood as a corporatized entity has global coverage, yet it is not reaping benefits and twenty five per cent of the profits are lost because legal strictures are not enforced. As he proceeded to explain what copyright meant, Mr Mistry said, ‘Copyright is the original right of creating something. Nobody can take that away from you.’ Though earlier you could sell your copyright for perpetuity, this has changed with amendments being introduced. The copyright can be the property of the buyer only for a certain number of years after which ownership reverts to the creator. A copyright is not technically required to be registered, but doing so is advisable as it informs a third party and can be used as evidence to sue plagiarists. Groups such as the Film Writers Association offer to have scripts registered with them and the court says this has some value against not registering them at all, since these are people who are part of the business. However, to avoid future problems it is best to register them with the copyrights office in Delhi or through a lawyer well-versed in copyright law. Where contracts are concerned, Mr Mistry advised that one should be specific when wording any correspondence with the other party to disallow any opportunity to find a loophole. Oral agreements are a risky proposition. It is best to have written agreements. He cautioned that even not responding to an email is tantamount to acceptance of whatever is contained in it. The starting point would be to educate oneself about whether one has ownership of copyright. 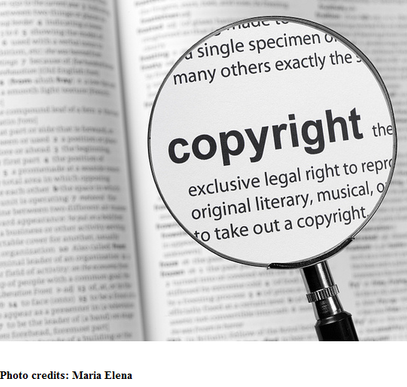 There is a host of creative output that can be listed under material that can be copyrighted. The examples are scripts for movies, plays, books, poetry, paintings, photographs, music, adaptations and improvisations; architectural blueprints and the buildings (not inclusive of the method of building); web pages and the design of a web page, etc. Even Housie tickets are copyrighted material because someone once had the sequential order of the numbers printed on the tickets copyrighted. Building on an incident where a freelance photographer was not credited for his work in a leading Goan daily, Ms Laxmi Maria Jenkins said, ‘First we should be aware of the difference between contract of service and contract for service.’ In contract of service, the person would be employed by the company and would be on the payroll. An example would be a journalist working for The Times of India. The newspaper would retain rights to reprinting the articles produced by the journalist as long as he is on the newspapers’ payroll. The right of authorship, however, would belong to the journalist. That is to say, he or she can defend the article from being distorted or modified without the author’s permission, even if it involves the newspaper that has employed the journalist. In contract for service, as in the case of freelance journalists and photographers, the creator has the right to authorship and the right to reproduction without impingement. They must be credited for their work when utilised. Under the amendment of the entertainment law, the creator cannot allow the collection of royalty (a royalty is the fee you receive when you licence your work to be used by another party) from his or her copyright to somebody else nor can the creator assign (sell) the copyrighted work to a third party. The ownership of the copyrighted material goes directly from the creator to the next of kin. There is no infringement of copyright only if the material is utilised in not-for-profit works such as research and education. In countries like Canada, the UK and the USA, each study or reference book cannot be photocopied beyond five pages. These pages have to be returned to the university library or else it will again be considered infringement of the author’s copyright. Where photography or videography is concerned, the subject of the same has to sign a release form that will prevent said subject (releasor) from claiming payment beyond the agreed amount stated in the release or from blocking future use of the photograph or film featuring the subject. The first credit for such work will always go to the photographer or videographer, then the agency the he/she works for and finally to the product company for whom the film or photographs have been shot. Ms Jenkins said that while Indian courts give the defendant and plaintiff equal opportunity to present their cases, in Canada it would be a different story altogether. The offending party would questioned as to the basis of their use of the copyrighted material and if they cannot produce proof of permission from the creator, the use of that material would immediately be stayed. It is much easier to penalise plagiarists these days thanks to globalisation. There is a network of lawyers working together in this regard and defendants can be brought to the country of jurisdiction. Lawyers can also be retained to pursue the case in the country where the defendant resides. A service mark (SM) is a trademark that denotes services provided by a company. A trademark or service mark covers words, logos, colour schemes that can be registered. Selection of names as trademarks or service marks has to be done warily because deceptive use of names can be considered infringement of trademark or SM. An example of this dilution of trademark would be a company selling socks with the brand name of a prominent company. The legal implications increase if the infringing party is selling the same product as the trademark owner and is thus cutting into profits. While other useful information was dispensed, those in attendance were advised to find lawyers who were thoroughly informed in their particular area of work in the entertainment industry, to guard them against future problems as well as resolve existing ones. People need to realise that these legalities exist not to create obstacles, but to contribute to the progress of our state and our country. Safeguarding individual intellectual property rights is a means to augmenting our economic growth. Furthermore, it creates a sense of security all around where everybody benefits in the end.